This is the fascinating story of how the Praying Mantis style came to be. Throughout history, the monks of the Shaolin temple have lived in close harmony with nature and have respect for all living things. They closely observed the animals and marveled at how they moved with such grace and power when defending themselves. This inspired the monks to study, imitate and absorb the mastery from each they choose to focus on. The five major animals styles they developed are Tiger, Panther, Crane, Snake, and Dragon. There are also many subcategories including Horse, Mantis, Scorpion, Eagle, Monkey, and Frog. Animal styles are a traditional hallmark of the Shaolin style. The book is about the story of Wong Long, which is based on obscure Chinese history that has long become a martial arts legend. 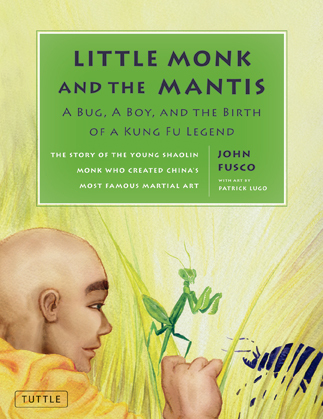 The boy lived and studied at the Shaolin Temple in the Henan province during the late Ming Dynasty (17th century), where he became the founder and master of Praying Mantis Kung Fu. He grew up a patriot, defending China from an emperor who wished to destroy the temples and have more control over the common people. I feel this book will move children and adults around the world to appreciate nature, be tranquil, and train the mind and body to be a physical expression of the Kung Fu code. John Fusco is an award-winning screenwriter with 10 major movies to his credit, including Young Guns, Hidalgo, The Forbidden Kingdom, and the Academy Award-nominated animated film Spirit: Stallion of the Cimarron. An avid martial artist, he began studying Tang Soo Do when he was 12 and currently holds a black belt in Northern Shaolin Praying Mantis Kung Fu. He lives on a farm with his wife and son in northern Vermont. Above image appears courtesy of publisher.